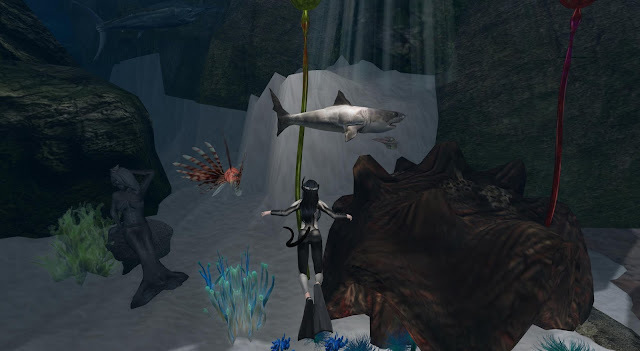 At some point of time in SL, there will be a chance for you to go dive deep to explore the ocean full of fantastic scene and then you will need a decent gear to look good in it. 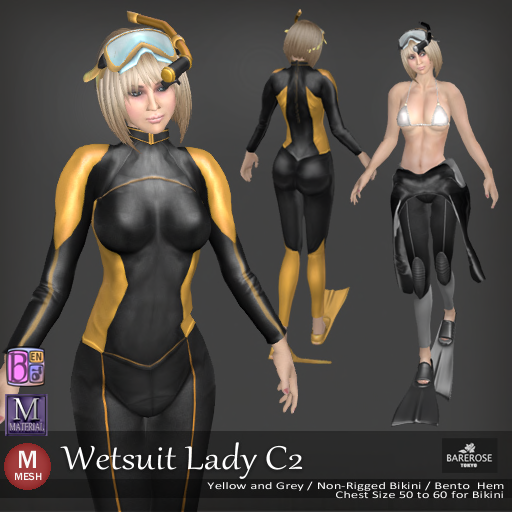 This is the time for Wetsuit Lady C2 from Bare Rose which feature not one, but 2 sets of colors and it consists of some variations for you to explore. The Yellow Wetsuit Lady C2 is one of the main colors and it comes with a full headgear google and fins. You will be perfectly covered for with all the gear shown for a enjoyable dive. While on land, the head mask can always be replaced with the GoggleUp version and you can pull down the top, which just hang around your waist for some sun and chill. There are even sets of Bikini provided so you do not need to go skin diving. Did you notice that this is the Grey color version of the wetsuit? Ready to face some awesome sea creature together with Kitty?